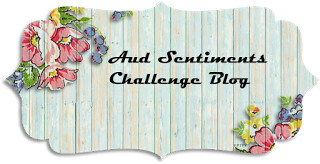 Today at Aud Sentiments #199 we have another challenge for you.. I wanted to keep the background simple so I added some tape adhesive behind the ribbon and added strips of ribbon to the background. I then colored the image with copics and added some dots of gold with Kuretake paint. I used My favorite things die to cut her out. I added foam behind and added the image to the base. I then used Stampin up sentiment and die and used some of the gold paint to go along the edge. I love the clean look and fun colors. hope you find time to play along. Just chose the row you want to use and create your fun card. Stunning Billie. Love the blue. 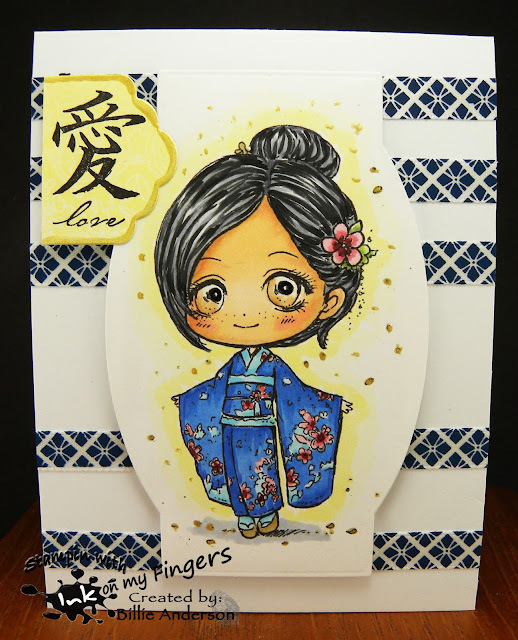 Lisa, what a lovely clean and simple card you have made here which fits perfectly the Colour Crazy Challenge this week. Such a cute image beautifully coloured in. Thank you for entering and best wishes in the draw. Kym (Colour Crazy Challenge Design Team Member).